running latest xcode/pods/osx, sample code from the Master branch. post your current podspec and error messages. I have this same issue with my own project too. Completely stumped on how to fix this one! Also try deleting the Pod folder and re-installing. maybe I have missed another step? In the next release I'll setup the submodule to pull from https instead of git protocol. See if that fixes the access issue. Success!!! thanks for all your help! May be I do something wrong but with the new 3.1.6 we have the same problem as describe up. 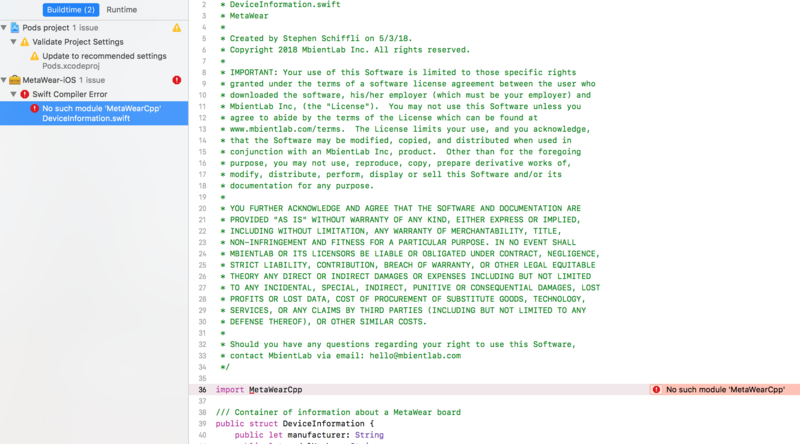 Are you installing the SDK through CocoaPods? If so, can you successfully install v3.1.5 like @ken was able to? I just cloned the git repo for the macOS Metawear SDK. I open the workspace for the StarterProject. I get the same error about the cbindings not being there. 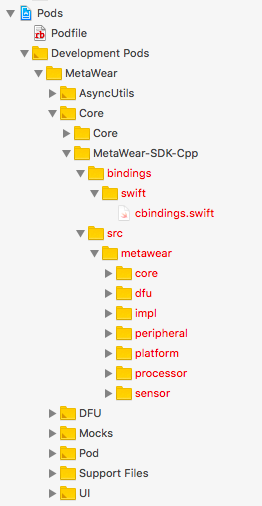 The pods file looks correct, but the Cpp stuff is not there. What is supposed to trigger cocoapods installing that stuff? I have cocoapods installed. I reverted to 3.1.5 and it builds and runs. Can you install v3.1.6 via the Podfile?